Ava Vidal, star of BBC2’s Mock The Week and BBC1’s Michael McIntyre’s Comedy Roadshow is setting out on a national tour with her brand new show ‘Ava Vidal Goes Dutch’. Ava explores with hilarious anecdotal tales about how much should we share… Would the world be a better place if we all were self-sufficient and just took care of ourselves? Ava’s knack for drawing comedic potential out of serious issues such as the nature of community and social inclusion leaves audiences on tenterhooks as she muses about her experiences in Holland, the cause of the recent UK Riots and the myths about the UK becoming more liberal. 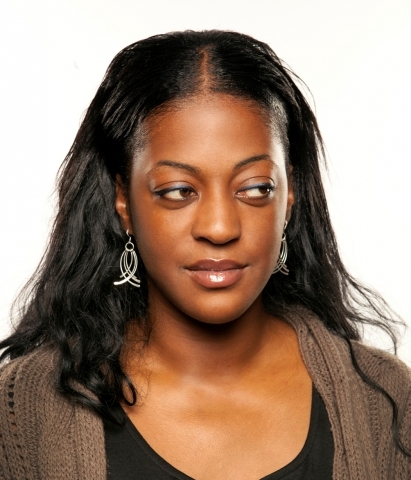 Ava has featured on numerous television shows, in addition to Michael McIntyre’s Comedy Roadshow (BBC1), Mock The Week (BBC2), she has also appeared in Kings of Comedy (Channel 4), and has strutted her stuff on Let’s Dance For Comic Relief (BBC1) and will be appearing on the BBC Comedy Gala. I ask if Ava thinks it is harder to make it in comedy if you’re female. Yes, it’s much harder; I was having this debate on Twitter today. I did a big charity gig at the Bloomsbury theatre in London, there were 5 women comediennes on the bill and the organiser was Tweeting all the TV shows asking them why these women aren’t on your shows? I’ve been trying to explain to her that most of the resistance we see comes from women. If I’ve been on ‘Mock the week’ most of letters of complaint are coming from women. Is that jealousy or envy or are women just more vocal about things they don’t like? Maybe, Mock the week has quite a young audience and I think it’s just the nature of the oppressed, It’s what people do, I guess they think they’re being clever. I think a lot of the females fancy the male comedians as well. Male comedians are almost like your mate down the pub, they can do material that we can’t do. Guys will say that Frankie Boyle’s hilarious but imagine if a woman said the things he does – you just wouldn’t be working. Yes, women do tend to be very self-deprecating on stage, almost to the point where you start to think, this is really stupid now, save it for your diary love. Oh I’m so lonely, I’m so fat and ugly, I think oh please - save it for your diary. I think I’m quite the opposite, I’m a bit of a ball breaker on stage. I don’t care, I’ve got jokes. When I was younger I used to think that comedians were just naturally very funny and can stand on stage and ad-lib and entertain off the cuff, now I realise that these are prepared shows, practices and polished. With that in mind, how long do you need to put a show together? This show was very easy to put together, mostly because I’ve not had the pressure of the Edinburgh festival to deal with this year, I’ve decided that I absolutely hate it. Edinburgh ruins your whole year. In January you have to think about your (show) title and look for a venue, and then you’ve gotta get your 40 words in the month after, then your 100 words and start thinking about press and PR, by the time it gets to June you’ll be like ‘Oh my god – I’ve got to write a whole show for August. This show has been really easy to put together without having the pressure of Edinburgh. What can we expect from you on Sunday? A really fun show, tackling issues, not too heavy although I’m getting a reputation for being a political comedienne but it’s not done in a heavy way. It’s just good fun and interesting for people to see. Do you like a good heckle? I don’t mind a good question; and I encourage my audience to talk to me through-out the show most of the time anyway but if it’s just a pointless insult, I find that boring, people can try if they want but they might get upset when I answer them in kind. As well as touring her comedy show and appearing on a raft of comedy TV shows; Ava can also be regularly heard on BBC Radio 4’s The News Quiz, Richard Herring’s Objective, and Stephen K Amos’s Idiots Guide To Life. She is also a seasoned writer, as well as penning articles for The Independent on Sunday, The Mail on Sunday, The New Statesman; she has recently completed writing for Gates, a new sitcom for Sky 1.